Verizon Nexus 6 is finally receiving the new Android 6.0 Marshmallow OTA update MRA58R. The new Marshmallow OTA update is around 702MB and packed with lots of bugs fixes and features. The new update will optimize the device performance, resolve known issues and apply the latest security patches. To know more about the Verizon Nexus 6 Marshmallow OTA update, check the carrier’s own page here. Most of the Verizon Nexus 6 users already get the over-the-air Marshmallow update on their devices. To check the update go to Settings > About Phone > Software Update to download Android 6.0 directly from their handsets. If you can’t see any update there then you have to wait for a day or you can flash the new OTA update manually on your phone. Thanks to the XDA member who captured the latest Android 6.0 Marshmallow OTA update for Verizon Nexus 6. 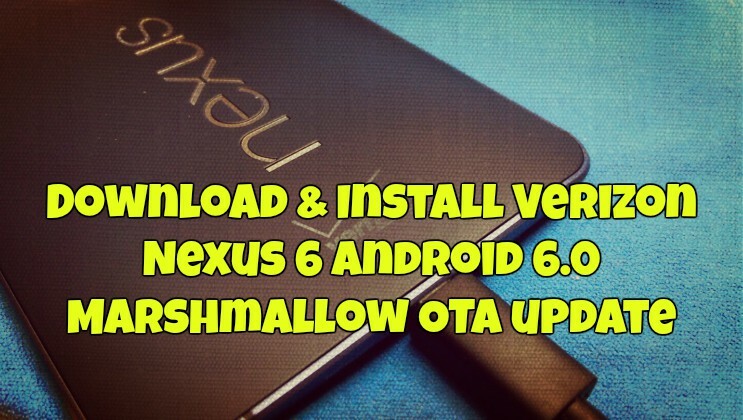 If you are the Verizon Nexus 6 android smartphone users and want to instal this new update on your phone, here is the complete guide to download and install the marshmallow OTA on the Phone. Before following the below mention procedure do take the backup of your phone. Download the build Android 6.0 Marshmallow OTA MRA58R file here and save it on your windows desktop. Once the OTA update file is saved on your windows PC, sideload the OTA zip file via ADB commands on your Nexus 6 android phone and flash the latest Marshmallow update on your phone. The process is very easy and takes a few minutes to apply the update on your phone. If you need help sideloading OTA updates and want to apply on you phone, hit up these instructions and follow them one by one on your Nexus 6 with this downloaded zip file.